Are you interested in participating in a collaborative global project? Do you have to cover the changes plants undergo in a complete life cycle, identify the parts used to produce specific products, and or describe how these products are produced in your curriculum? If your answer is yes, this is the project for you! 1. 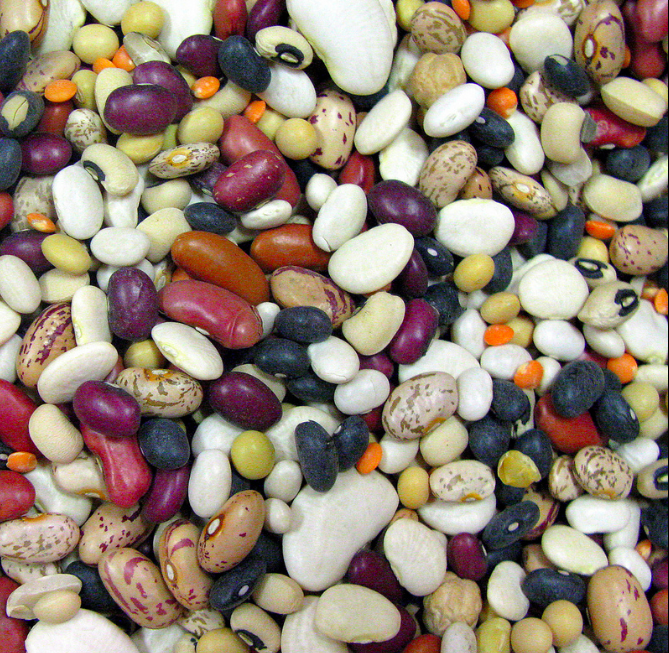 Soak the beans, or seeds of your choice in water overnight. 2. Have students stuff an open jar or a plastic baggie with a moistened paper towel or cotton balls. 3. Have them place three beans between the glass/baggie and towel, and moisten as needed. 4. Post pictures, video and or audio to the wikki to share with the other classes. 5. Ask students to observe: on the third day, the seed may be soft and fat. On the fourth day, the skin may loosen and the root may begin to appear. On the sixth day, root hairs may begin to sprout from the big root. On the eighth day, pale shoots may sprout, representing the beginning of a green plant. When the leaves and roots are well developed, have the students plant the bean plant in a pot of soil. 6. 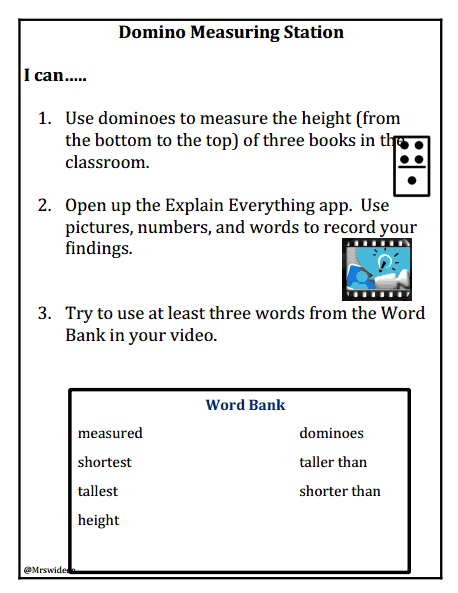 Have your students record all of their observation over the next few weeks. Use the Book Creator App for a multi-media creation filled with audio, video, text and images from your students. Have each student create a personal seed journal on Explain Everything, creating a new page each day of the project. 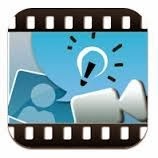 Take a picture each day for a stop motion project with an app like iStopMotion for the iPad. Math in my classroom may look a little different in my room than other classrooms. At first Glance, it looks a bit chaotic and messy. You may not see me at first glance, I might be playing a math game with a student, or working with a small group on the carpet, or going over the math concept that we are currently working on with a group that needs a little extra help at the guided reading table. I teach 75 minutes of math everyday. My grade 2 students start with 10 minutes of an App called FlowPlus to practice their addition and subtraction facts. They write their score on the back page of their math book each day and try to beat their score from the previous day. I then teach a mini lesson to the whole group on the carpet. We then do some sort of activity to reinforce the concept. 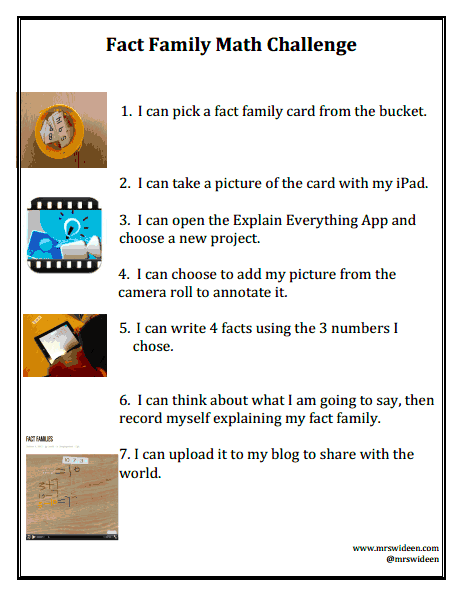 This might be on the iPads, using white boards and manipulatives, a game, a partner activity or a worksheet. I usually work with a group that is having difficulty with the concept at this time. When students are finished the activity they go to a math station. Students are partnered up with the same student each day and usually do one station that is preassigned. All of the math stations are concepts that have already been taught in class. The math stations reinforce the skills the students already have. When creating a math station, I want students to be accountable, however I don't want copious amounts of paper to look at. I also work with students to assess their knowledge of the math concepts during math stations and use this one on one or small group time to get a clearer picture of where they are and what they need assistance with. strategies and how we arrive at an answer. 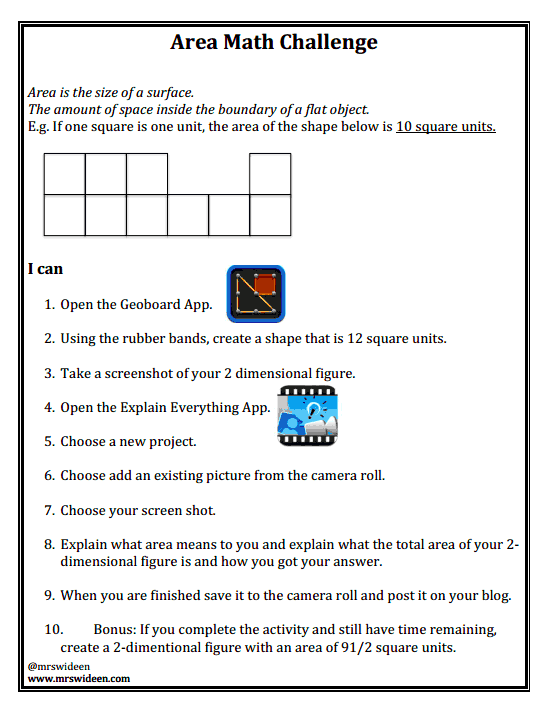 This has led me to create many stations that incorporate the Explain Everything App. 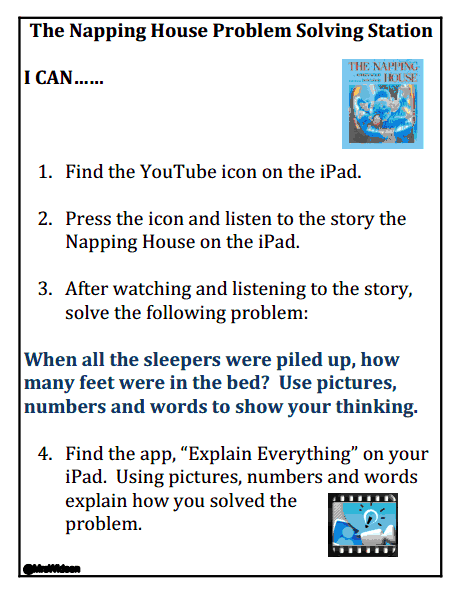 Students use this app to explain and show their thinking. 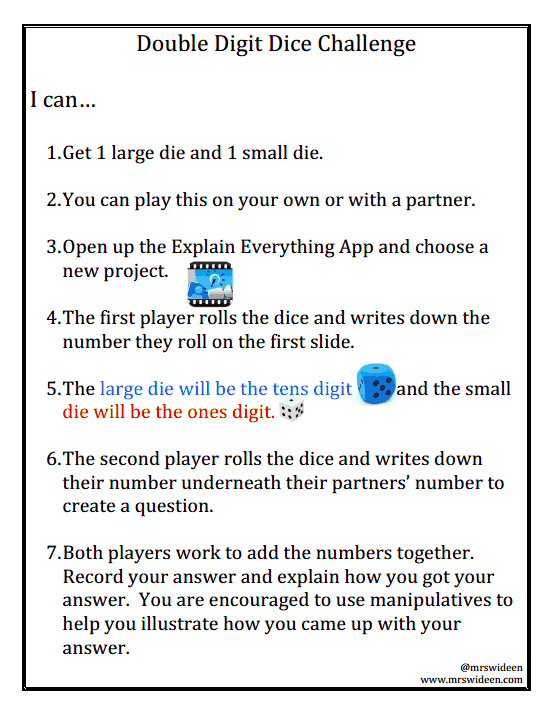 Here are a few new math stations I have created and a few old favorites. Feel free to download them and use them in your class if you wish. On a side note, my students upload their Explain Everything's to their blogs. Having an authentic audience and getting feedback from others is a big engagement piece for my students. They also like tweeting our their EE creations to our class Twitter feed. This can be done easily with Explain Everything. One last tidbit to think about, if you have a great student example, upload the example to your Youtube channel, create a QR code that links to the completed explain everything and attach the QR code to the back of the task card. If your students have questions or want to check their work before submitting they can scan and watch the video.